After a chilly spell, the sun was back out today and the sub-zero temperatures have subsided! 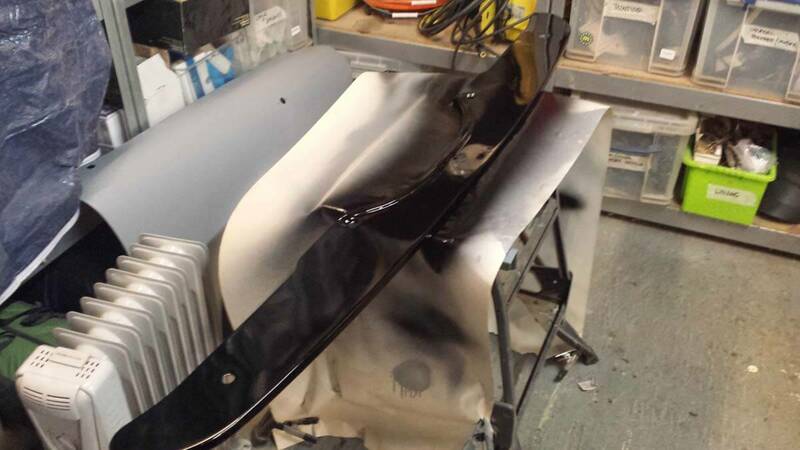 After the last post where the bumper was filled and sanded, the bumper was ready to be sprayed with another level of primer (to cover the filler) and then the colour. Even though the temperature was warming up, I have put together a little booth which I can heat up to get the panels a bit warmer, and so the paint cures quickly. As you can see in the video below, the primer went on in a couple of coats. It was mixed about 20/80 with thinners, just to ease it through the spray gun – it’s advertised as ‘ready to spray’, but I imagine you’d need a wider gun opening as it’s fairly dense. After the primer had dried, it was sanded down with 400 grit, to give the colour coat a key. The colour used was Super Gloss Black, which is a cellulose based paint. This paint is more forgiving to DIY’er and the garage environment, as it can be sanded and buffed after spraying. If you were using 1k or 2k paints, you’d be best off with a clean environment and an air fed mask. Also, as those paints require a clearcoat on top, it is much harder to remove imperfections afterwards. The paint is mixed 50/50 with high-gloss cellulose thinners, then for the last coat it is diluted down to 70/30 in order to provide a smoother finish. In the video below, the first coat was sprayed before the camera was switched on, but you can see the next 3 coats. The first coat is a thin ‘dry’ spray, just to make sure there are no unwanted reactions with the primer/filler below. After that has gone on, the next three coats are sprayed far thicker to build up decent layers. Be sure to obey the flash times between coats, this will be listed on the paint ‘tech-sheet’, and is usually around 15-30 minutes for cellulose paints. The bumper is left to dry overnight, then it will be flattened with a fine sandpaper, in order to be buffed to a shine with the dual action polisher. Check out the finished job in the next post.